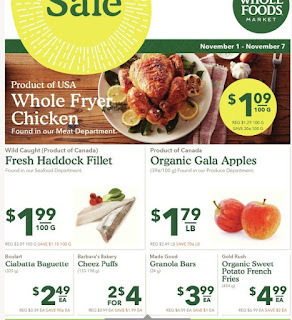 Whole Fryer Chicken $1.29 Regular Price $1.09 100 g Sale Price $0.20 Savings Product of USA. Found in our meat department.Annie Chun's Noodles Bowls -Teriyaki or Peanut Sesame $5.99 Regular Price $3.99 Sale Price $2.00 Savings 221-246 g found in our grocery department. Dream Non Dairy Beverages $3.99 Regular Price 2 $6.00 Sale Price $0.99 Savings 946 ml. 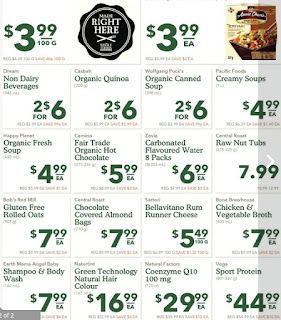 Casbah Organic Quinoa $5.99 Regular Price 2 $6.00 Sale Price $2.99 Savings 200 g.
Wolfgang Puck's Organic Canned Soup $3.99 Regular Price 2 $6.00 Sale Price $0.99 Savings 398 ml. Pacific Foods Creamy Soups $6.39 Regular Price $4.99 Sale Price $1.40 Savings 1 L.
Happy Planet Organic Fresh Soup $5.99 Regular Price $4.99 Sale Price $1.00 Savings 650 ml. Camino Fair Trade Organic Hot Chocolate $8.99 Regular Price $5.99 Sale Price $3.00 Savings 275-336 g.
Zevia Carbonated Flavoured Water $9.99 Regular Price $6.99 Sale Price $3.00 Savings 8 x 355 ml. 8 pack. Central Roast Raw Nut Tubs $10.99-$12.99 Regular Price $7.99 Sale Price 225-325 g.
Natural Factors Coenzyme Q10 $39.99 Regular Price $29.99 Sale Price $10.00 Savings 120 ct. 100mg. 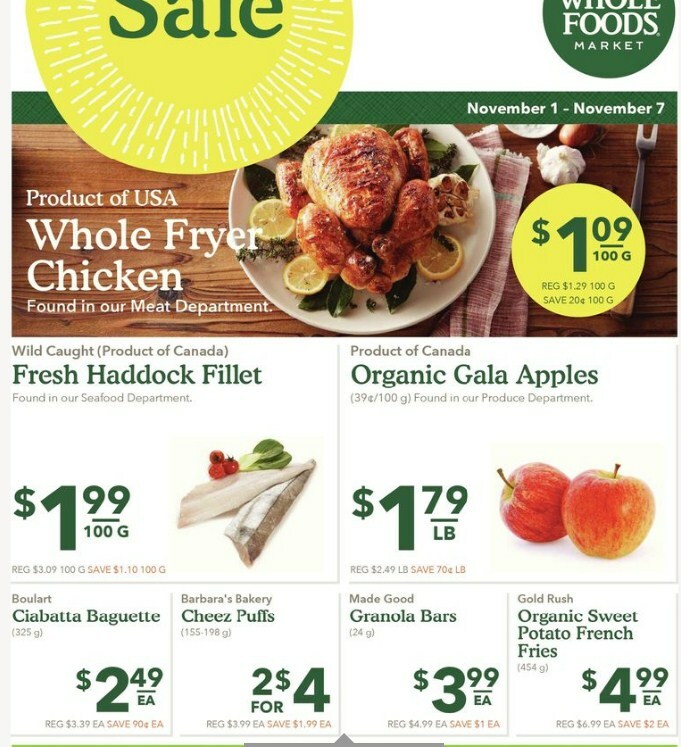 Bob's Red Mill Gluten Whole Foods Flyers Free Rolled Oats $9.99 Regular Price $7.99 Sale Price $2.00 Savings 907 g.Central Roast Chocolate Covered Almond Bags $9.99 Regular Price $7.99 Sale Price $2.00 Savings 270 g.Sartori Bellavitano Rum Runner Cheese $6.99 Regular Price $5.49 100 g Sale Price $1.50 SavingsBone Brewhouse Chicken & Vegetable Broth $9.99 Regular Price $7.99 Sale Price $2.00 Savings 600 ml.Earth Mama Angel Baby Shampoo & Body Wash $11.99 Regular Price $7.99 Sale Price $4.00 Savings 160 ml.Naturtint Green Technology Natural Hair Colour $22.99 Regular Price $16.99 Sale Price $6.00 Savings 165 ml.